I am trying to fit a trivariate model with 3 continuous variables. I am also trying to fit the independent and common pathways models but I do not know if my script is correct. I think that number of parameters is correct but I am not sure. Also, I have negative values (for example dl_1_1, fl_2_1) and I do not know if it is correct. Finally, I am not sure how to get the standardized results for this model. would be correct the square of each value? For al_1_1, dl_1_1 and el_1_1, would be square root? I think that number of parameters is correct but I am not sure. The "saturated" ADE model is supposed to have more free parameters than the other two. I think it might be good for you to try setting up these models with umx ( a high-level wrapper for OpenMx), and only worry about writing a full script if umx doesn't do what you want. Take a look at the attached demo script for umx, from this year's Boulder Workshop. 19 as_1_1 as 1 1 8.4181968e-07 0.116274385 ! 0! 22 ds_1_1 ds 1 1 1.4744784e-05 0.594878427 ! 0! 23 ds_2_2 ds 2 2 1.4553241e-05 0.244555807 ! 0! 24 ds_3_3 ds 3 3 1.0000000e-05 0.104726102 ! 0! So, I have the same number of parameters for the ADE and IP models am I doing something wrong? Now that I think about it...with only 3 phenotypes, you would indeed have the same number of parameters for the IP and vanilla ADE models. They would be alternate parameterizations of one another. Since you're interested in genetic variance shared among traits, I suppose the IP parameterization is easier to interpret in that way. Give the CP model a try. 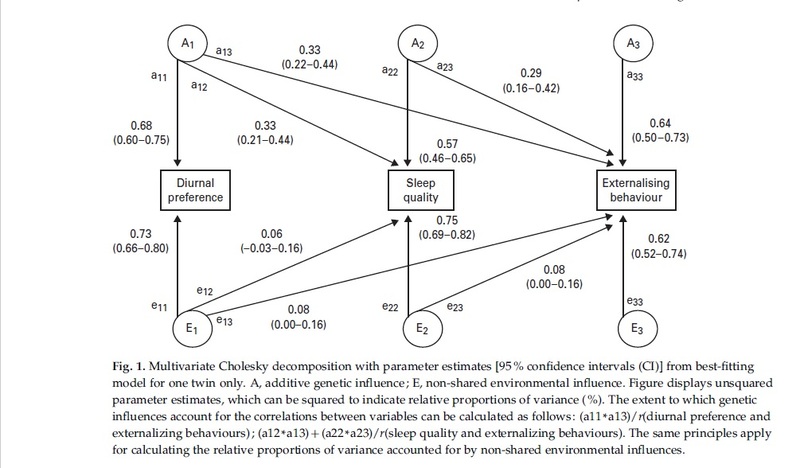 You should have 24 parameters in the CP model (9 for the model-expected means, 3 for the common-factor variance, 3 common-factor loadings, and 9 for the unique variances). Note that, for the CP model, umx identifies the scale of the common factor by fixing its variance to zero via an MxConstraint. There are other ways to identify the model that don't require MxConstraints. I mention this because MxConstraints can make optimization more difficult. You are right the CP has 24 parameters. Attached you can see the result. I do not know if the results are reasonable. I have negative values for example dl_1_1, fl_2_1 or ac_1_1. I think that is correct but only to be sure. Also, I need to know how to get the standardized value it would be the square of each value? I am also concern about the total value for A I mean in the ADE model a2 for the first variable is 0.2402 if I want to know the total a2 for this variable in the independent pathway model It would be (ac_1_1)2 + (as_1_1)2 ? but the result of that is 0.18 is this discrepancy normal? Or I am doing something wrong. Thank you so much and sorry for the inconveniences. I do not know if the results are reasonable. I have negative values for example dl_1_1, fl_2_1 or ac_1_1. I think that is correct but only to be sure. That's OK. Those parameters are common-factor loadings of one kind or another. They're only identified within a change of sign. For instance, in the IP model, you could flip the sign on ac_1_1, ac_2_1, and ac_3_1 all at once and not change the model fit. Also, I need to know how to get the standardized value it would be the square of each value? Standardized value of what, specifically? I am also concern about the total value for A I mean in the ADE model a2 for the first variable is 0.2402 if I want to know the total a2 for this variable in the independent pathway model It would be (ac_1_1)2 + (as_1_1)2 ? but the result of that is 0.18 is this discrepancy normal? (ac_1_1)^2 + (as_1_1)^2 gives you the raw additive-genetic variance in the first trait. The value 0.2402 you reference is the additive-genetic variance proportion (a², the standardized additive-genetic variance component). However, I notice that your vanilla ADE model gives an additive-genetic variance of 0.1628 for the first trait, but the IP model gives a value of (-0.4202)^2 + 0^2, or 0.1766, which is slightly different. In your case, the vanilla ADE and the IP model would be equivalent models. Is the -2logL at the solution the same for both of them? Also, are there lbounds at zero on some of the free parameters in the IP model? So, I thought it would be the same for my model. Am I doing something wrong? Are these values (from the slide) previously standardized? How can I check if there are lbounds at zero on some of the free paramenters in the IP model? Are these values (from the slide) previously standardized? Judging from the title of the slide, I'd say yes, they've been previously standardized. That is, the estimates have been re-scaled to be what they would equal if all variables in the model had unit variance. So there's a difference in -2logL of almost 2, but they should have equivalent solutions. The lbounds should appear in the parameters table in summary() output, if there are any. been re-scaled to be what they would equal if all variables in the model had unit variance. But in my output that is not 1. Should I re-scaled before presenting the results? I would like to know what is the most correct way to present the results that or the raw data? 19       as_1_1     as   1   1  8.4181968e-07 0.116274385 ! 0! 22       ds_1_1     ds   1   1  1.4744784e-05 0.594878427 ! 0! 23       ds_2_2     ds   2   2  1.4553241e-05 0.244555807 ! 0! 24       ds_3_3     ds   3   3  1.0000000e-05 0.104726102 ! 0! The standardized path coefficients are probably the preferred way to present the results. Try providing argument addStd=TRUE to umxIP(). Then see if you get the same -2logL as the vanilla ADE model. Did you try re-running them with mxTryHard()? If not, give that a try. Actually, never mind. We talked about this at the OpenMx developers' meeting this morning, and it turns out I was mistaken. In your case, the IP model is actually a more restrictive model than the vanilla ADE model, even though they have the same number of free parameters. So, you should be getting a slightly worse fit from the IP model.